A guide to the best toys available for Christmas for children. 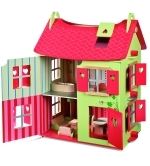 Whether you want a wooden toy, dolls house, electronics kit, craft or science set, jigsaw or construction set we have something special for every child. Children are central to Christmas and most of us want to ensure the children in our lives have a magical Christmas, especially when they are younger. One aspect of Christmas is the exchange of gifts. Originating in western culture the exchange of gifts has long included some attributed to Father Christmas (also known as (also known as Santa Claus, Saint Nicholas or St. Nikolaus, Sinterklaas, Kris Kringle, Père Noël, Joulupukki, Babbo Natale, Weihnachtsmann, Saint Basil and Father Frost). Whether the gifts are from a family member or Father Christmas we all want to ensure that the gifts are exciting and attractive whilst also having the potential to last past the new year. At the kidEstore.co.uk educational toy store our philosophy is to offer challenging toys that are still great fun and very desirable to kids. We believe that the most educational toy in the worlds will bring no benefits if children won't play with them. We have built this site to give you a cross view of the toys available for boys and girls of different ages. Just click on Girls or Boys above or use the links to the right.